When getting your home’s exteriors and interiors painted, a reliable contractor with knowledge, skill and efficiency is the need of the hour! You wouldn’t want to hire just anyone to get it done because a bad paint job can easily make a beautifully constructed house look ugly. With that said, allow us introduce ourselves and tell you why Houston Texas Painters are the perfect choice for your residential painting needs in Cypress. Firstly, you should know that our team is no ordinary bunch of painters; they are hardworking perfectionists! No job is too complex or challenging for the experience and skill they possess. Apart from this, you’ll find the working staff at Houston Texas Painters to be very friendly and cooperative. We are more than happy to help customers pick out appropriate color tones for their interiors and exteriors depending on the information we are given. 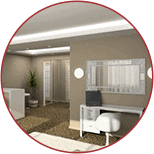 We will explain what works best for the ambience you are hoping to create. Of course, if you know exactly what you want, we will deliver nothing short of your expectations. 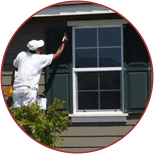 Homeowners looking for painters in Cypress, TX will be pleased to know that we respond swiftly and offer free quotations. Our rates are reasonable and booking is a breeze! For quick contact or rescheduling appointments, our mobile app is very popular among our customers. We do not hold you to a contract or any commitments; when dealing with Houston Texas Painters, you can expect complete transparency. Furthermore, we are not like other painting contractors that try their luck with upsells and waste your valuable time in the bargain. We sit, listen, follow instructions and do our jobs! There is always the question of safety for your home and family when it comes to inviting strangers into your home. 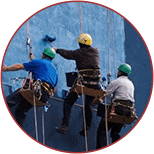 Well, we assure you that our painters are thoroughly screened and reference checked, while being fully insured for added security. We have successfully painted houses across Texas, including Cypress home, and have never received any negative feedback about our painters. On the contrary, our customers were kind enough to give us great reviews for our services. 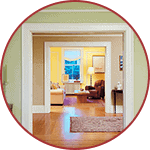 We use high-quality paints with manufacturer’s warranty to further reassure our customers of a desirable result. Although we are thorough professionals equipped with top of the line products, we like to give our customers the upper hand by offering a 7-day period for free touch up work (should any flaws come to light). We are always confident in our work but nevertheless, will happily come back to take care of any touch up needs. To make payment, you can choose the most convenient option for you; we accept major credit cards, checks and online transactions. Rest assured we use highly advanced technologies for complete security, including SSL encryption, for all internet transactions. So if you live in or around Cypress, TX, a perfectly painted home with just the right colors in all the right places is a mere 60-second booking away! Contact us today for your free quotation and let us bring your walls to life!